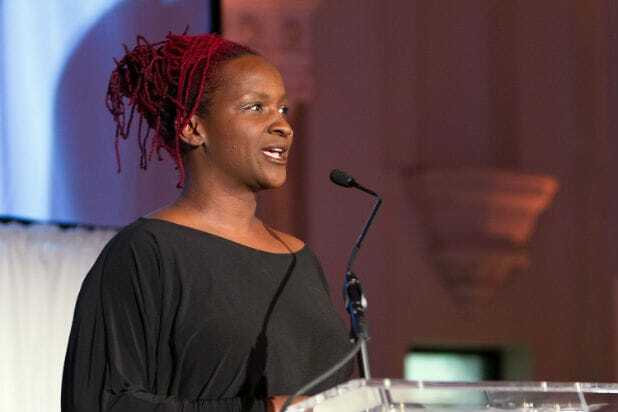 Producer and accidental television star Effie Brown opened up about her onscreen conflict with Matt Damon on HBO’s “Project Greenlight,” saying she was encouraged to stay silent during the controversy — and it paid off. Appearing in Park City, Utah, Monday as a keynote speaker for the Women at Sundance Brunch, Brown reflected on her flap with “Greenlight” producer Damon over hiring people of color for the film production at the center of the reality series. Many found Damon’s remarks about diverse hires patronizing and insensitive. “That show exposed systemic exclusion of Hollywood in a real mainstream way, on a Sunday night, you got to see it. That show was riddled with this,” Brown said. The room exploded with applause for Brown, who is now a VP of production and development at Lee Daniels‘ Fox-based production company. There she’ll oversee a fund to recruit diverse storytellers and below-the-line talent for film and TV. Brown put a challenge on supporters in the room, reminding them to push for action when it comes to hiring policies. “It is my personal belief that, by not doing one of these three things, we are by standing — we are cosigning on this system that we say we want to change. Those three things are hire, mentor and invest,” she said. Ellen Page / Actress / "Tallulah"
Markees Christmas / Actor / "Morris From America"
Carla Juri / Actress / "Morris From America"
Craig Robinson / Actor / "Morris From America"
Craig Robinson & Markees Christmas / Actors / "Morris From America"
Abigail Spencer / Actress / "Rectify"
Ant Timpson, Tim League / Producers / "The Greasy Strangler"
Daniel Noah, Josh Waller, Elijah Wood / Producers / "The Greasy Strangler"
Danny DeVito / Actor / "Wiener-Dog"
Gus Halper / Actor / "Goat"
Ben Schnetzer / Actor / "Goat"
Nick Jonas / Actor / "Goat"
Austin Lyon, Nick Jonas, Gus Halper, Danny Flaherty, Jake Picking, Brock Yurich, Ben Schnetzer / Actors / "Goat"
Nick Jonas & Ben Schnetzer / Actors / "Goat"
Riley Keough / Actress / “Lovesong,” "The Girlfriend Experience"
Timothy Simons / Actor / "Christine"
Rob and Sheri Moon Zombie / Writer, Director and Actress / "31"
Lily-Rose Depp / Actress / "Yoga Hosers"
Nate Parker / Actor / "The Birth of a Nation"
Sarah Gadon / Actress / "Indignation"
Clea DuVall / Director / "The Intervention"
Amy Seimetz / Actress / "The Girlfriend Experience"
Kyle Chandler / Actor / "Manchester By the Sea"
Thomas Middleditch / Actor / "Joshy"
Lucas Hedges / Actor / "Manchester By the Sea"
Kevin Smith / Writer & Director / "Yoga Hosers"
Harley Quinn Smith / Actress / "Yoga Hosers"
Alison Brie / Actress / "Joshy"
Mary Stuart Masterson / Actress / "As You Are"
Justin Long / Actor / "Yoga Hosers"
Austin Lyon / Actor / "Goat"
All the latest from the Sundance Film Festival.